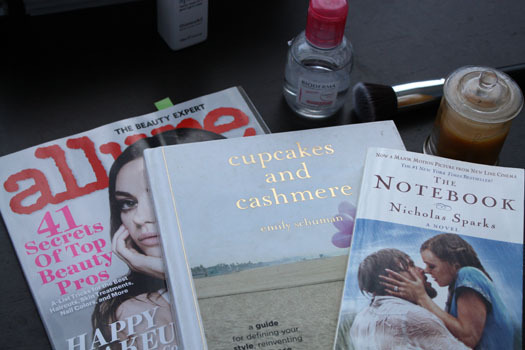 Rounding off the reading pile is Allure. This magazine is near-impossible to track down, only one store I know of locally stocks it, but it is well worth searching for. Allure is the beauty lover's dream and the whole magazine is essentially devoted to beauty with a little bit of fashion thrown into the mix. This issue contained a breakdown of Mila Kunis' makeup look, how to depot your makeup, interviews with top makeup artists, behind the scenes of Mac Cosmetics and more. If you love beauty, want insider knowledge, expert opinions and more then you definitely need to keep an eye out for this. So I'm off back to the tea drinking and page turning of my current reads, Blog, Inc. in case you were wondering. Additions to the reading pile are always welcomed, my pen and paper are on standby awaiting more recommendations to jot down. Allure isn't too expensive, at least the sea freight editions aren't. It's just a pity it's so darn difficult to find here!